Sprinkle the mix on the roasted papad & serve immediately. looks yummy and the presentation is so cute.. I make this when I crave a snack and top Microwaved papads.. nice idea to use smaller ones.. :) Cute. masala papad are very common in bangalore's restaurants. ur small masala papad looking lovely n tempting.:). I love masala papad. Looks yummy. Hey this is a cool idea to use mini papad for masala papad! Aww! That is cute... with those little pappads... would make a great appetizer I assume. Good and healthy evening snacks. The papads are so small & cute. I make them for sudden guest as appetizier..cute small papads, simply fabulous sri.. Cute small papads...I always use the bigger ones from now on I'll use the small ones.Good one. thats so cute!..am sure this will be a great hit in parties ,...its been a while since I made these! Papad snack looks temping, good one Sri. 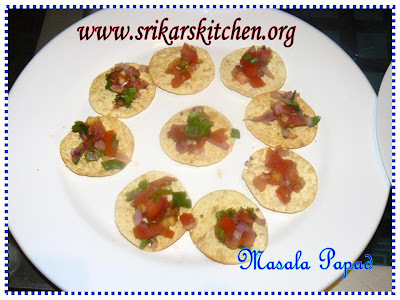 hey they look so cute.....nice idea to use the small ones this way.....a simple tasty one..
Masala papad looks lovely and tempting. Thanks for sharing the recipe. Lovely snack to have on a lazy day..;-)Love masala pappads and your small version looks pretty!! Perfect appetizers for a party..